Al-Qaida's Paper Trail: A 'Treasure Trove' For U.S. From its earliest days, al-Qaida leaders insisted on receipts for everything from floppy disks to explosives. Experts say that was the influence of Osama bin Laden, who earned an undergraduate degree in economics and public administration. That obsession with record-keeping has come back to haunt the organization. Al-Qaida is known to keep meticulous records. Experts say that's the influence of Osama bin Laden, shown in 1998, who was obsessed with documenting everything. 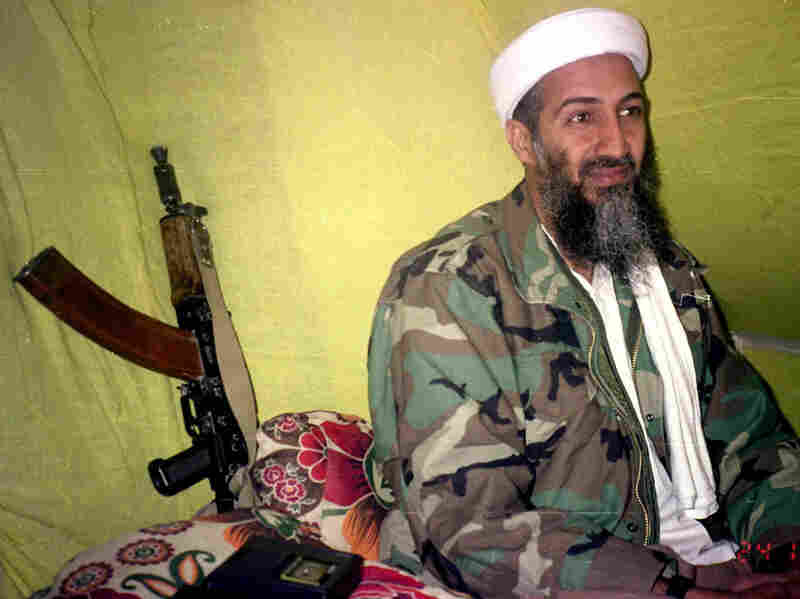 When U.S. commandos stormed Osama bin Laden's compound earlier this month, they spent much of their time on the ground shoving papers, CDs and thumb drives into huge document bags strung around their necks. That sweep was considered an integral part of the operation, and it confirmed what the intelligence community had long believed: that bin Laden was obsessive about documenting everything. Experts say that was the influence of bin Laden. Before he became the ideological leader of al-Qaida, he got an undergraduate degree in economics and public administration. He clearly applied what he learned to the organization. "I think this treasure trove of intelligence reflects the fixation or the preoccupation that al-Qaida always had with massive record-keeping," says Bruce Hoffman, a terrorism expert at Georgetown University. That "may be an effective way to run any organization, but also results in a windfall of intelligence to any counterterrorist agency or intelligence community charged with dismantling that organization." In spite of those inherent risks, al-Qaida was built in a way that it clearly had to create a paper trail. With affiliates sprinkled around the world, and leaders who could only communicate intermittently, al-Qaida's efficiency required a paper trail. "There's almost this sense that they can't help themselves," says Lt. Col. Reid Sawyer, the head of West Point's Combating Terrorism Center. "It's this idea that when you have a distributed movement, that you have to gain efficiencies in various means. And one way to do that is to keep very good records and to understand the disparate parts of your enterprise." The intelligence gathered on the bin Laden compound isn't the first time the U.S. has had the opportunity to scoop up key al-Qaida records. On the eve of 9/11 ... the State Department has stated that al-Qaida had 60 offices worldwide. I mean, in essence it was a multinational. One of the first big troves of intelligence on the group was discovered in the fall of 2001, shortly after the U.S. invasion of Afghanistan. Ground troops found literally hundreds of thousands of pages of records in al-Qaida safe houses. The documents laid out al-Qaida's founding bylaws; they included personnel records and receipts for explosives. There were stacks of files and detailed HR policies. That cache proved that al-Qaida was unlike any terrorist organization that had come before it, Georgetown's Hoffman says. Rick Nelson, a senior fellow at the Center for Strategic and International Studies in Washington, sees al-Qaida's next stage — succession — as just as corporate as its other practices. The only difference is that for al-Qaida, there is more than just shareholder anxiety at stake. "Right now it's important for them to name a leader before they lose momentum," Nelson says. "It's important for them to show they are operationally in control of the organization, and they're not doing that." Part of the reason: Bin Laden's obsession with record-keeping has come back to haunt the organization. Al-Qaida doesn't know what the U.S. discovered at the compound, so leaders are lying low.